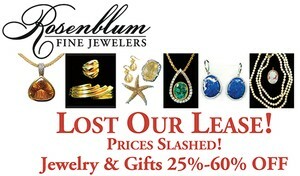 Our friends at Rosenblum Fine Jewelers have lost their lease, and must sell all their upper end jewelry before Christmas. Jo Rosenblum King is in a breakfast club with my wife Ann. Many of you may know Jo's husband Steve - he is the pharmacist at the HEB on Buffalo Speedway. Jo is scrambling to sell her inventory. Her store is located in the Hilton Hotel on Post Oak Blvd in the Galleria. There is complimentary self-parking. Her extended sale hours run from 10 am to 2:30 pm on Monday, and from 10 am to 6 pm Tuesday through Saturday. If none of that works for you, call Jo at 713-888-0808 or email her at jeweltalk@aol.com and she will meet you by appointment. Check it out - holiday gift-giving has never been easier!